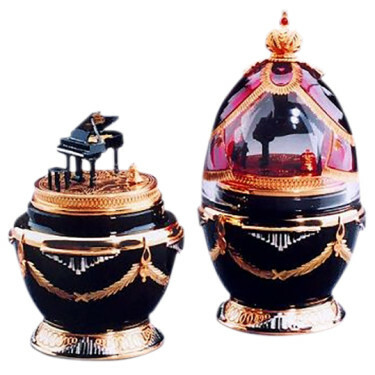 The Piano Egg in gold, sterling silver and crystal, celebrates the 300th Anniversary of the development of the first Pianoforte - the first piano is recorded in the Medici family's inventory of 1700. The Russian imperial crown surmounts a mouth-blown crystal top, hand-enamelled with luxurious red curtains and gold tassels. 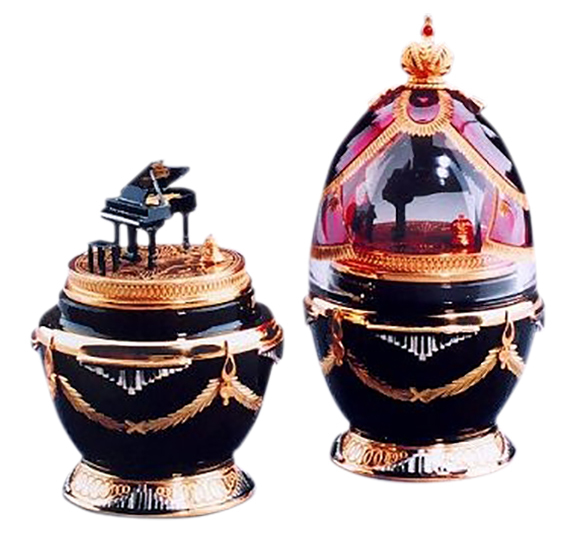 The black-lacquered silver piano stands on a vermeil stage: the surprise is revealed by the footlight - a single turn, and Tchaikovsky's first Piano Concerto is played. Materials: Gold, sterling silver and crystal.